Party Reveal: Sugar & Spice - A Baby Shower for Twins! One of my closest friends found out she was having twins—yep, one girl and one boy! It’s such an exciting time and a total blessing. I was quick to jump on board and start designing the components of the baby shower. We went over a few different themes and color schemes. All three invite options had a similar look, but the winner was the sugar and spice theme, and the color palette was made up of pinks, aquas and reds. This party was filled with DIY projects—banners, fabric buntings, fabric candy and lots of sweet decor! The candy cookies provided by The Cookie Jar matched the invite perfectly! Here I made oreo truffles dipped in pink and aqua candy melts, inserted long lollipop sticks and topped with matching washi tape. Fondant cupcake toppers by Edible Details are mini works of art. To continue the theme, I made “Sugar & Spice Shower Scrub” as favors. 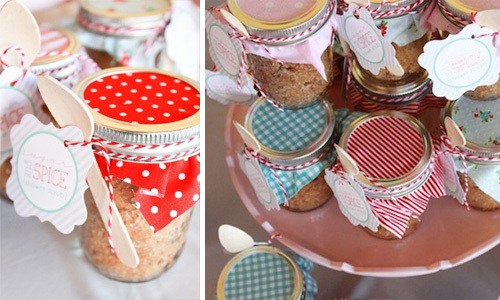 I took mason jars and filled them with homemade scrub, dressed them up with 4″ squares of fabric, tied on a mini wooden spoon with bakers twine and a printable tag. Do you have a fun shower theme or DIY? Upload your pics to our gallery and you may just get featured! So sweet and jolly – I love the sweeties wrapped up in the blue paper with roses on – adorable! Very nice and very sugary-spicy details. How did you make the sugar and spice shower scrub? Care to share your recipe for that? There are actually a lot of recipes online. You can try Martha Stewart or even Pinterest! Hi, I absolutely love the center baby shower invitation and my sister-in-law is having twins, a boy and a girl. Is there somewhere that it can be purchased? Are you able to share where you purchased the red polka dotted trays from?